Norah and Gavin have now lived in Canada for three years with Aunt Florence and Aunt Mary. Norah is glad to spend August at Gairloch, the lavish cottage on an island in Muskoka, where she can swim and canoe and enjoy the company of the many cousins who come to stay. Soon after she arrives, however, she has a problem: she falls in love! The object of her crush is Andrew, one of the visiting cousins. Since Andrew is much too old for her and doesn't return her feelings, Norah is plunged into misery. Andrew has his own problems, for he doesn't want to fight. Both of them have to come to grips with some complex moral questions about war. When I started to write THE SKY IS FALLING I thought it would be one book about the five years Norah and Gavin spent in Canada, but when I got to the end of the first draft it was still 1940! At once I decided to extend their story into a trilogy. I have very clear and painful memories of both being a teenager and having my first crush, so I used these memories in the book. I first visited Muskoka when I was thirteen, staying with my aunt and uncle, then with my friend's family. 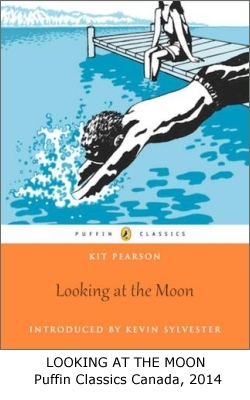 Although I was bullied at the latter (see description of why I wrote A HANDFUL OF TIME), I was captivated by the clear water, the rocky landscape and the elegant old cottages, so much grander than the humble cabins I was used to in Alberta. 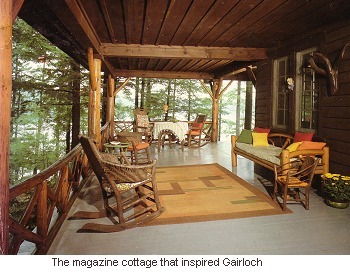 Gairloch is based partly on one of the houses I visited on Lake Joseph and partly on a magazine article about an old Muskoka cottage. While I was researching this novel someone actually took me to the same cottage that was in the magazine! It was like walking into my own book.